This area gets drenched in sunshine, allowing meals to be shared outside throughout the year. Just around the corner is the external beach shower, used as often as Clif can squeeze in a quick surf at the nearby beach. The spacious living area can be completely opened up to the elements, thanks to the folding glass doors. The double-height ceiling and a row of high windows make the room feel huge. The boxy white sofa and matching armchairs were discovered at a charity shop. 'There was no way I was going to pass up the chance to snap them up!' says Ingrid. For similar seating, try the Indivi 2 sofa and Fly chair, both by BoConcept. 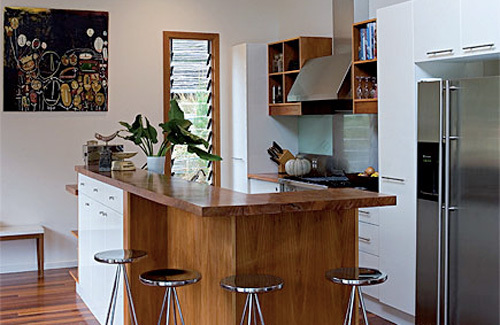 The common theme throughout the house is the extensive use of Australian timbers. The floors are ironbark, the fascia and external walls are western red cedar, the kitchen bench is one giant piece of river red gum, and the cabinets are Sydney blue gum veneer. 'We tried to incorporate as much recycled timber as we could; we both love the sense of history it gives and it's more eco-friendly,' says Clif. In keeping with the rest of the house, the open-plan kitchen is simple but well thought out. The focal point of the space is the island unit topped with a single piece of river red gum that took many hours to get a highly polished look.